Various tequila bottles in sunlight. Image credit: Aaron Sherman (c) 2005. (PhysOrg.com) -- Whoever thought that science was a dry subject might change their mind after learning about a new discovery in which tequila is turned into diamonds. A team of Mexican scientists found that the heated vapor from 80-proof (40% alcohol) tequila blanco, when deposited on a silicon or stainless steel substrate, can form diamond films. The key to the surprising discovery is tequila's ratio of hydrogen, oxygen, and carbon, which lies within the "diamond growth region." The resulting diamond films could have inexpensive commercial applications as electrical insulators, say researchers Javier Morales, Luis Miguel Apátiga, and Víctor Manuel Castaño from the National Autonomous University of Mexico (Morales is also with Nuevo León´s Autonomous University). Originally, the scientists were experimenting with creating diamonds from organic solutions such as acetone, ethanol, and methanol. They found that diluting ethanol in water resulted in high quality diamond films. The scientists then noticed that the ideal compound of 40 percent ethanol and 60 percent water was similar to the proportion used in tequila. "To dissipate any doubts, one morning on the way to the lab I bought a pocket-size bottle of cheap white tequila and we did some tests," Apátiga said. 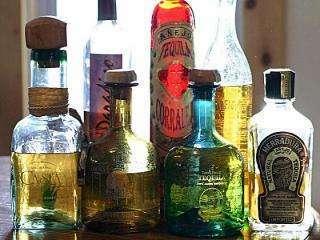 "We were in doubt over whether the great amount of chemicals present in tequila, other than water and ethanol, would contaminate or obstruct the process, it turned out to be not so. The results were amazing, same as with the ethanol and water compound, we obtained almost spherical shaped diamonds of nanometric size. There is no doubt; tequila has the exact proportion of carbon, hydrogen and oxygen atoms necessary to form diamonds." In their experiments, the scientists grew the diamond films using "pulsed liquid injection chemical vapor deposition techniques." In a specially made device, they heated the liquid tequila to 280 ºC (536 ºF) to transform it into a gas. In a reaction chamber, they heated the gas to 800 ºC (1470 ºF) to break down its molecular structure, resulting in solid diamond crystals of about 100-400 nm. The crystals fell onto silicon or stainless steel trays, accumulating in a thin, uniform film. The high temperatures removed all of the tequila´s carbon impurities to result in pure diamonds. The final diamond film was hard and heat-resistant - properties that could make the diamond useful as coatings for cutting tools, high-power semiconductors, radiation detectors and optical-electronic devices, the scientists explained. They plan to begin industrial-scale applications around 2011, and hope to interest a tequila producer in widening its market beyond the traditional beverage. For now, the scientists are continuing to test different tequilas´ abilities to produce diamonds. They´re also working on creating doped diamonds, which contain impurities, to serve as semiconductors. More information: "Growth of Diamond Films from Tequila"
I have to ask: is this with or without the worm? 40% abv is what vodka, tequila, rum, whisk(e)y, and some gins typically are. It seems odd that they would leave out the other options. It turns out this was done in Mexico, where tequila is readily available; so that makes sense. But I imagine vodka would be a better option since it contains less impurities. Ah! One more reason to keep drinking...diamond-lined kidneys! This is really big for the computer industry and replacing silicon conductors--Moore's Law continues. Hmm.. Tequila costs more than pure alcohol so what's the advantage? Hey, if you use Mescal with a worm, do you get green diamonds??? No, you need lime for that. I wonder if they have tried adding salt. What I want to know is what possessed them to connect diamonds with tequila. There not even making good diamonds? Just industrial films? Oh the humanity!!!! If they touch my Jack Daniels we'll have some issues. If they just want to make diamond films there are other sources grind up the Hope diamond or something less important than my various grain alcohols. Ah, women have been turning booze into gems forever. Think Monroe, Channing and Mansfield.